Analytics – Improve Consulting Group Inc. Organizations are capturing and storing unfathomable amounts of information including operational, human resources and financial data. The term “big data” is now becoming common place and the rate of growth of data storage continues to grow exponentially. As long as this information has been collected, many organizations have been presenting this data as Key Performance Indicators (KPIs), metrics, benchmarks or targets but articles and news related to the amount of data being captured are more common than stories that detail the benefits of good analytics. As an example: Company X customers ordered 10.83 products per month on average in 2016. Would you say that is good or bad? With no context, it is impossible to tell! Now consider this one chart based off the same year of results for Company X. 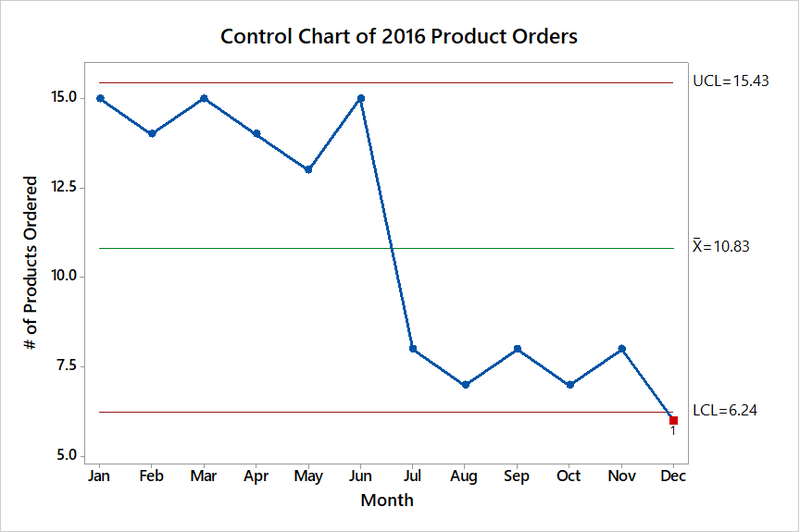 This control chart tells a much better story about performance than just reporting the average orders per month. Something has happened in June/July that had a negative shift on the number of products ordered. There is other extremely useful information contained within this one chart, but the observed shift is enough to signal that more investigation is required into product orders. Only by understanding our current state performance can we accurately target areas for improvement and measure how effective improvement strategies have been. Improve has the experience to create or enhance your current reporting systems so that you know your true current level of performance. We can help extract and report on the information that matters to you, either through creation of ad-hoc reports, or the design and build of sophisticated reporting systems that produce performance reports at the touch of a button.